Should downstate and suburban school districts pay the hundreds of millions in costs to fund their teacher pensions? A group of Chicago area state lawmakers says yes, arguing that it’s a better way to level the playing field between Chicago and other school districts. But not everyone is on board. Here’s a map illustrating how the cost shift proposal would impact counties. Those colored green would see more school funding under this plan, and those colored red would lose money. Click for a larger image. The idea has been around for years, endorsed in the past by House Speaker Michael Madigan, and resurrected again today: A group of House Democrats from the Chicago area Thursday are proposing that all suburban and downstate school districts take on all of their teacher pension costs. Right now, the state pays those costs, which total around $800 million. That would mean all school districts would join Chicago in funding their pensions ,which are paid through local property taxes. Mayor Rahm Emanuel has pushed for efforts supported by Gov. Bruce Rauner and Senate President John Cullerton that would have the state pick up about $200 million of Chicago’s teacher pension costs. 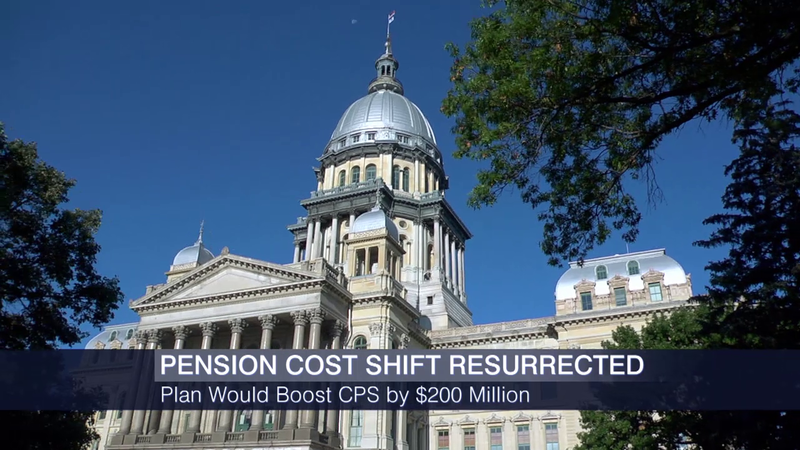 This cost shift plan would put the money that the state saves in pension costs back into the state’s general education fund, which would be doled out to schools. The bill’s sponsor says that would mean $200 million more for Chicago Public Schools every year, and additional funding for other financially disadvantaged school districts. But the cost shift is a tough sell for suburban lawmakers. One Chicago alderman said he would support the plan because he felt it would be a long-term structural change that would result in continuous extra funding for Chicago. “I hope this bill becomes part of a conversation and dialogue as the governor, mayor, senate president and speaker look at revamping our education funding bill,” said Ald. Will Burns (4th Ward). Other school funding proposals include Senate President Cullerton’s bill that is sitting in the House that would freeze all local property taxes, have the state pick up $200 million in Chicago teacher pension costs, and also lower the yearly contributions the city makes. Rauner’s school funding plan is similar, but with the caveat that local districts would have the ability to curb public union collective bargaining. If there is any action on this or other education funding proposals to help out CPS, they won’t happen for at least two weeks. The House is out of session until Aug. 25.